This serves me right for reviewing something just because everyone hated it. Curiosity killed 101 minutes. I think I’ve seen enough (read: too many) movies to draw some conclusions on what is in a bad movie. And through this, I’ve found there’s nothing more agonizing than finding talented actors stuck with a bad script. House at the End of the Street is chock-full of some absolutely moronic writing, but contains effective and commendable performances from its actors. They should have gotten some sympathy baskets. This movie was filmed in 2010, before Jennifer Lawrence was able to appear at the forefront of “up and coming” performers. I wonder what it would have taken for her to appear in it today, two blockbusters and one Academy Award later. This is about Elissa (JENNIFER LAWRENCE) a high school student who has moved with her mother (ELISABETH SHUE) to a house in an otherwise nondescript suburb. The house next to theirs is shrouded in mystery and murder. Some years earlier, a girl named Carrie-Ann murdered both her parents in one spooky lightning-infested night. Now the only one who lives there is the introverted son, Ryan (MAX THIERIOT), who was with a relative at the time of the murders. He wants to fix the house up and sell it. There’s nothing wrong with him at the start, really. He wears a lot of flannel shirts and is more or less approachable. But it’s weird that a person would choose to live alone in the same house where his sister killed their parents, no? Well, he is an outsider. He’s bullied by others on a regular basis and a local police officer (GIL BELLOWS) has defended him on multiple occasions. But as all movies go, we find out Ryan isn’t what he seemed to be in the first place. This leads to a moderately surprising twist ending, and I was pleased to see some kind of silver lining at the end of this movie. But it’s just not worth sitting through the rest of it to arrive at the conclusion. It’s inexcusable that a movie whose concept was supposedly in development for seven years before production would be this poor. The script is loaded with those jump scares – you know, that thing where something of varying degrees of threat suddenly appears behind, in front, or alongside the main character and is accompanied by a loud clanging sound via the soundtrack. I made a count of how many times this happened – the final tally was 11 (or roughly one jump scare every 9 minutes and 45 seconds). Only one worked for me, and that was only slightly (I wasn’t paying attention to the screen and when it happened, I jerked my head up towards the screen to see what was going on). Additionally, most of the plot points that lead up to the finale are reliant upon increasingly absurd and hastily written events. 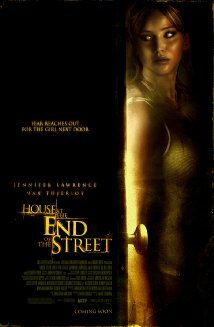 House at the End of the Street wastes a clearly talented cast – while Lawrence doesn’t need to prove her talent or potential to anyone at this point (then again, she had to when this was filmed), she does a good job in her role, which requires parts skill and vulnerability. Thieriot is effective as the neighbor – the character’s personality is required to change as what minimal story there is evolves, and he handles each with about as much precision as one can put in to a screenplay like this. Few others are really given enough screen time to be considered memorable or poor. One thing I noticed is that, like a lot of movies from the past couple decades, the main credits (names of the director, stars, writers, etc.) are listed at the end in a fittingly atmospheric and creepy sequence. This was placed in the wrong part of the film. Had this been moved and presented as an opening credits sequence, this would have been worthy of creating a creepy atmosphere and would have been good at engaging the viewer. At the end, it’s more or less pointless. “Pointless” may be the definitive descriptor of House at the End of the Street – it’s not that memorable and its overwhelming negatives sink its handful of positives. Simply put, it’s just plain bad.